Asks the intercession of the Apostle for governments to understand that "globalize not mean hogging but give"
The first edition of Camino ends Obradoiro had starring Terry Porter, who was able to complete the last stage on a sunny day, accompanied by a lot of fans. 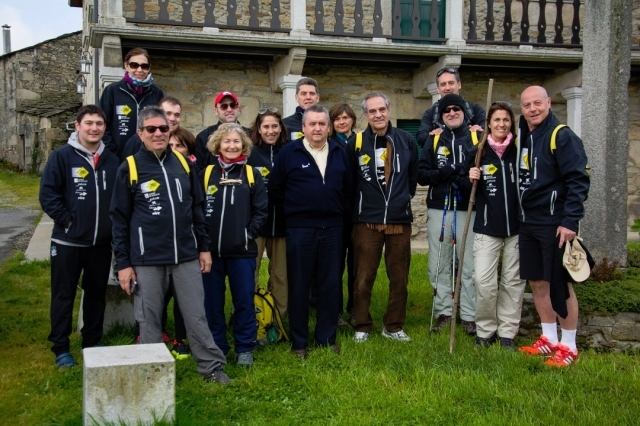 The second edition has had the participation of another illustrious pilgrim, another large base, Juan Antonio Corbalan. But the pleasant weather of the last year this time gave way to a day of rain and wind. Which he was played for Real Madrid and the Spanish team that won the silver medal in Los Angeles in 84 completed the Xacabea route with a much smaller entourage, with the same sympathy than its predecessor, and equally pleased with the experience. Upon arrival at the Obradoiro Square met the ritual embrace the Apostle, but not aprevechó to ask for anything special, "the apostle must ask few things, but are of universal utility. I think all of us, not deserve anything or need anything. I always ask that some people do not suffer in the world and that we can solve, I mean countries and governments that can fix it once and for all, understand that globalize not mean hoarding but otherwise give. Throughout the week of pilgrimage and a meeting with the president of Obradoiro, Raul Lopez, he pledged to join the club. And not alone: "I think here will leave four or five new partners", said the conclusion. At the moment, witness Sunday's game Multiusos de Sar versus Valencia and hopes that victory to stay home. "He needs more work," he added.